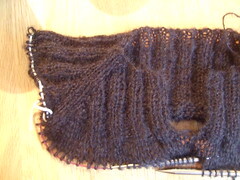 I’ve also started a 3 hour sweater in Sirdar Blur. I’m modifying the pattern to make this one top down. The top down version is going very quickly – it will still take me a lot more than 3 hours though! I will post my modifications if it turns out O.K. Oh yippy! I can’t wait to get my hands on the proper yarn and needle to make this work. Thank you! I was lucky enough to be one of the testers. This is a GORGEOUS sweater when finished. I did mine in a furry yarn (Moda Dea Dream) and I just adore it. The link on my name will take you to my blog post on the sweater. I will be making more, no doubt! Wow – Thank you so much for sharing the pattern. It’s a lovely cardi! I just want to add my praise to the others. This is gorgeous! 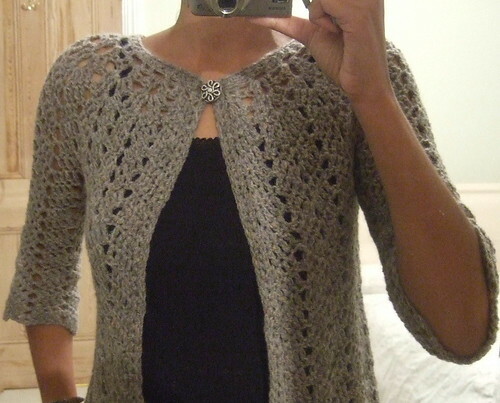 I’ve sent you a separate e-mail cos I can’t download the pattern from here (just like the Eva’s shawl!). Thank you again and best wishes. Thanks so much for the pattern. I just completed a navy blue version and it looks and feels great. I added a color and made the button band a bit wider. I’m going to crochet this pattern again, using a rust color wool. I think I’ll add about 12 stitches to the stitch pattern to accommodate my width! Gorgeous! Thanks so much for sharing the pattern. I’m going to bookmark this for spring. I made this a few weeks ago in Knit Picks Cotlin, coffee colored, and I LOVE it. I wore it for the first time yesterday and it fit perfectly and was so comfy. I made elbow-length sleeves and cropped length. I crocheted ties mid-way down the front intstead of buttons. Got lots of compliments. I´m from brazil and in new in Ravelry.com, so I have to tell you that I looooove this cardigan. I make 3 in cotton yarn, named Bella; now I will crocheted one more in wool. This is just lovely! Thank you SO much for making the pattern avaialable….cant WAIT to try it! Thank you for your beautiful cardigan pattern. I have difficulty with rw 6 – I will either have to skip 4 sts or DC into 4 – and on and on with continuing rows. Please help. Thank you. Thanks so much for your response – I have my problem solved. Looking forward to finishing your beautiful pattern.